Santa Cecilia Granite with dark cabinets Backsplash ideas will open a new window in your mind during the kitchen remodeling process. My target is giving the best possible solution for your kitchen. I would like to share the name and the characteristics of the backsplash, the color and glaze of the dark cabinets to make much more visual approach in kitchen remodeling process. These days the dark tone cabinets are being very trendy and Santa Cecilia is a good choice for contrast lovers in a kitchen. Another good trend is stainless steel appliance with dark color cabinets. The tone and color of Santa Cecilia brings good enough contrast with dark cabinets in your kitchen. In one of my previous article Friendly Feature: Santa Cecilia Granite, the backsplash colors are like white, cream, bone, or light tone earth colors. I would like to add the darker tone earth colors and even taupe color dark tiles in this article. Santa Cecilia Granite with dark cabinets backsplash ideas will surprise you with the nice combinations. 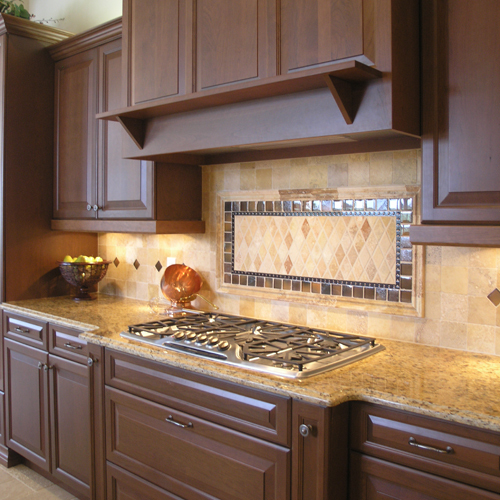 The material for the backsplash can be ceramic, glass, travertine, natural slate, or Santa Cecilia Granite herself. The type of the backsplash tile would be subway, mini subway, matchstick, 4×4 Square and mosaic. Picture Credit: Cameo Kitchens,Inc. Maple wood customized stain cabinets and valance, Santa Cecilia Granite Countertop, Stainless steel appliance and diagonal set up white glazed carrara marble 4×4 tiles. The flooring is light oak. Under the cabinet lighting, recess lights and natural light give a smooth look this loving contrast in that traditional kitchen. I really like the L shape island and curvy lines on the cabinets. Fascinating design. Picture Credit:Building Materials, Inc. Dark Mocha cabinets and friendly feature Santa Cecilia match very well with Loose Stack Slate in African Blaze backsplash and Terra Cotta ceramic flooring. In the first sight backsplash and glass door cabinets are very attractive but whole piece is awesome. Picture Credit:Arthur Rutenberg Homes. Espresso Cabinets, matchstick natural color glass tiles and Santa Cecilia Granite Countertop in eclectic design kitchen. The selection of ceramic light color flooring and light color fabric chairs bring a rich taste of balance. Very sophisticated design. Picture Credit: Superior Cabinets. The elegant touch of the Macaroon Stain on cherry wood cabinets with santa cecilia granite and travertine square backsplash . Traditional kitchen is more attractive with these harmonic trio. Picture Credit:Creative Cabinets and Faux Finishes, LLC. Walnut Stain Dark cabinets go super well with santa cecilia granite , and cream subway tiles,lovely design. I like the light color hardwood flooring and lighting in the kitchen as well. Picture Credit:Reflections of You by Amy LLC.,Dark cherry cabinets with glass doors , two tone travertine diagonal backsplash and sweet piece of granite, All in one for a dream kitchen. Picture Credit: Marie Burgos Design via Houzz. I really like the idea of using dark colors in a small kitchen, Usually small spaces have lighter colors but the reflections and shadows are dancing in here. Glossy upper side and matte flooring combinations are amazing. Hats off detailed work with keen eyes. It shows the friendly feature of Santa Cecilia very well when black high gloss onyx color custom cabinets, stainless steel appliance and taupe color glass subway tiles bordered with assorted colors of matchstick glass tiles are around. Please do not hesitate to participate to my article and please put your Santa Cecilia Granite with Dark Cabinets backsplash ideas pictures of your kitchen in my comments. Thank you for your help and reading my article.